In the past, it took several weeks to get a crown made. The impression was taken in your dentist’s office, then sent off to a lab where the crown was manufactured, then sent back to your dentist’s office for fitting. In the meantime, you would wear a temporary crown, which was not as attractive or as durable as your final crown would be. Now, though, CEREC technology allows us to create your dental crowns in one visit. You can leave wearing a permanent, attractive, all-ceramic crown that will last for years. CEREC is what is known as a CAD/CAM system, short for computer-aided design and computer aided manufacture. The CEREC process for getting your crowns made begins the same as the regular process—your tooth is prepared in the traditional way. But instead of using plaster to make an impression of your teeth, a sophisticated digital image of your teeth is taken. A highly visible powder and digital camera are used to take an image of your teeth. This image comes right up on the monitor. 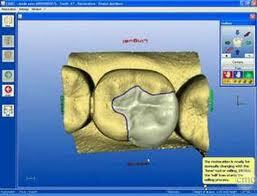 Then Dr. Jeff Johnston can use this image and the CEREC software to precisely design your new dental crown. Once the design is complete, it is stored in the computer. Next, you will talk to Dr. Jeff to select the right type of ceramic for your crown. He will give you advice on the performance parameters and select the right shade to match your teeth. Then this ceramic block is placed inside the CEREC mill. Using a diamond grinder, the CEREC mill precisely fashions the crown to the exact specifications that Dr. Jeff created. This takes less than fifteen minutes! CEREC can also be used to make porcelain fillings. To talk to Cherry Creek dentist Dr. Jeff Johnston about this remarkable technology, please contact Ascent Dental today.